After 30 years of international acclaim, they perform in Milwaukee for last time. After 30 years as one of the few recorder ensembles in the world, the Flanders Recorder Quartet of Belgium returns to Milwaukee on its farewell tour. Early Music Now, which last year celebrated its 35th year as host to early music groups, has seen a few such farewell tours as long-term performers move on. Early Music Now was one of the first U.S. venues to host the Flanders ensemble. This is their fifth appearance in Milwaukee. The Flanders Recorder Quartet will perform early this Saturday evening at St. Paul’s Episcopal Church. Bart Spanhove, Paul Van Loey and Joris Van Goethem are original members. Tom Beets joined the group 12 years ago. All of us have heard recorders, but the plastic toys most remember are a distant echo of the quality instruments that have been carefully crafted as contemporary reconstructions of Renaissance and Baroque instruments. Recorder music was pervasive in those two eras. After that time, the instrument fell out of favor. Wind instruments evolved with a wider range and louder volume. 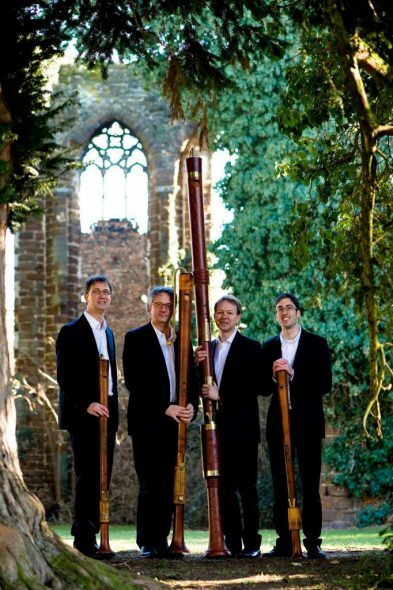 When playing early music, the quartet matches the recorders on which they perform to music of the period. “Every country, every period had different recorders,” Spanhove says. “We try to play the authentic music.” This requires working with contemporary instrument makers who faithfully copy the designs of earlier instruments. The quartet will bring many instruments to the stage on Saturday, as each musical choice will call for matched selections. On the other hand, most selections require adaptation by an ensemble of recorder-only players of music typically written for a range of different instruments. The complex polyphony of the Renaissance period offers abstract, beautiful lines of four equal parts. That music was not often written for a consort (ensemble) of recorders. Renaissance recorders were of limited range, but when a consort of matched instruments are created, the sound can be powerful. Works by Michael Praetorius, Thomas Preston and Robert Parsons represent that era. Baroque-era recorder music was written for a solo instrument or a recorder taking upper register parts in a mixed ensemble. The quartet has arranged such music for a recorder-only consort. The basso continuo, background line, often played by harpsichords, viola da gamba, therbo or cello has been transferred to newly designed bass recorders. These seven- and nine-foot, contemporary looking creations allow Baroque music to be played by a pure consort of recorders. Works by Johann Herman Schein, Joseph Bodin de Boismortier and J S Bach will represent the Baroque era. Spanhove finds works by J S Bach particularly easy to adapt for recorder quartet. The quartet has arranged two major works by Bach, Passacaglia in G, (BWV 582) and Concerto in A (BWV 596, after Vivaldi), and a set of choral works for organ. In contrast to Renaissance music, Baroque music is meant to be more expressive. The music of Baroque times was seen as a language – reflecting the experiences of life. The mood of a piece requires communication, among the players and with the audience. The quartet often plays contemporary music, sometimes written for them. Two short works by Pierto Campo and Jan Van der Roost appear on this “early music” program. Campo’s music reflects earlier styles. Van der Roost’s lighter music uses the sounds of recorders to evoke impressionist landscapes. As the Flanders Recorder Quartet ends its 30-year run, what is the future for this music? Because of the teaching of Spanhove and his colleagues, there are perhaps 100 professional recorder players in Belgium. But there are perhaps only 5 professional ensembles in the world. It can be difficult in these days, Spanhove says, for a group to teach and tour in the United States. Now, he says, “you have to prove you are famous.” He worries about how younger European ensembles will fare if it continues to be difficult to tour in the U.S.
Those who attend this concert should prepare to set aside their current impressions of recorder music. This concert offers the best of what the Early Music Now series can deliver: consummate professional performances, authentic sounds and informed re-creations of the music of different times. The Flanders Recorder Quartet concert begins at 5:00 p.m. Saturday, February 17. A pre-concert lecture will begin at 4:00 p.m. St. Paul’s Episcopal Church is located downtown at 914 E. Knapp St., at the corner of Broadway and Juneau. Parking is available on the street, and in the Lincoln High School of the Arts parking lot across the street from the church. The Early Music Now series continues March 17 with Canada’s Ensemble Caprice at the UW-Milwaukee Zelazo Center. The program, iLove Baroque, combines recorder duo, cello, guitar, and percussion to weave together eight short stories with music covering two centuries and five countries, by Bach, Falconiero, Schmelzer and Vivaldi.